The 800 year old Hanseatic city of Lemgo lies at a crossroads of medieval trade routes, surrounded by green hills and floral splendour. The landmark of Lemgo, the two towers of Saint Nicolas Church, welcomes you into the heart of the city and to a visit that con-nects past and present times. Experience a world of Gothic architecture and beautiful Renaissance facades. Tree-lined and grass-covered ramparts surround the historical city centre. Enjoy the rich culture and beautiful nature – and relax. The 800 year old Hanseatic city of Lemgo lies at a crossroad of medieval trade routes, embedded by green hills and floral splendour. The symbol of Lemgo, the two towers of St Nicolas Church, welcome you into the heart of the city and to a visit that connects past and present times. Experience a world of gothic architecture and beautiful renaissance facades. Wooden embankments surround the historical city centre. Enjoy the rich culture and beautiful nature – and relax. The historical Hanseatic town of Lemgo rests in a beautiful landscape, surrounded by wooded countryside, between the Teutoburg Forest and Wiehen Hills, in the heart of the county of Lippe. Lemgo is one of the most picturesque towns in the region. Many visitors fall for the charm of the city, staying for a couple of days in order to enjoy and visit all the sights of Lemgo. The city was founded in the 12th century. Due to the activities of the Hanseatic League, Lemgo was influenced by international activity and wealth soon after. Witnesses to those times are the 250 buildings within the town wall which are listed and protected. They form most of the restored town centre. The unique mixture of historical buildings, modern architecture, small town charm, and the warmth of the inhabitants, have made Lemgo well-known and well-loved. The Town Hall and the museum Hexenbürgermeisterhaus (witches-mayor’s house) are particularly impressive examples of the Weser Renaissance. The latter is now the Town History Museum, and Brake Castle houses the Weser Renaissance Museum. Lemgo also has a lot to offer for employers and employees alike. In recent times, Lemgo has enjoyed a pleasing economic revival. Lemgo firms are, for example, international market leaders in dental and lighting technology and metallurgy. In addition to a broad-based school system, the town also hosts the Innovation Campus Lemgo. The Innovation Campus is a centre of science and research. Technical colleges and Ostwestfalen-Lippe University of Applied Sciences with their variety of business, science and technology courses come together with players from economics and research, such as Fraunhofer and the partners of the Centrum Industrial IT (CIIT). The goal is to concentrate the whole chain of innovation of digital economics in one place – from career orientation to education, further training, and studies to research, development, and business start-up. Our most successful national champions are the TBV Handball Team. But they are not the only ones to benefit from our excellent sporting facilities.. The town is renown for the multifaceted sports on offer. Our high-profile successes include tennis, canoeing, artistic cycling, baseball and triathlon. Art and culture lovers will not miss out in Lemgo. 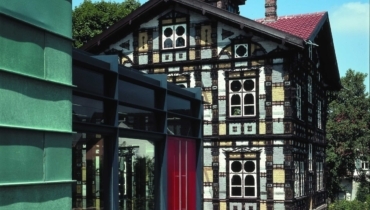 Besides the Hexenbürgermeisterhaus and the Weser Renaissance Museum, there are the art gallery Eichenmüllerhaus and two special places: The Junkerhaus is a unique timbered house, dominated by wood on the outside facade as well as the interior of the rooms. The artist Karl Junker spent years decorating the house by carving abundant ornaments and crafting pieces of furniture of exquisite quality. Together with the wall and ceiling panelling, the decorations and furniture form a unit. Jewish life in Lemgo is what the Frenkel-Haus is devoted to. Visitors of this memorial place can learn all about the life of the family of Lemgo’s honorary citizen Karla Raveh. Lovers of live performances such as concerts, plays, readings and comedy shows will enjoy the many-faceted big and small stages of the city. On the International Day of the Hansa, Lemgo celebrates the Hansa by having the traditional Hansefrühstück (Hansa breakfast). Since 2003, visitors flock to the “Stone Hall”, as Lemgo’s marketplace is known, on every third Saturday of May. The joint breakfast starts at 10 a.m. The initiative Frauen für Lemgo (Women for Lemgo) ensure that nobody goes hungry or thirsty. From sandwiches and other baked goods to coffee and juice, the Frauen für Lemgo fulfil all culinary wishes. Along with food and drink, there is also an entertainment programme at the Hansa breakfast. The Jazz-Pop band of the Lemgo musical school and dance groups exhibit their talents. A live roasting of a special kind of coffee, the Lemgo Hanse-Baune, is a must-see for all coffee lovers. Families especially enjoy free guided tours on the International Day of the Hansa. A guided tour through the city highlights and explains the visible influence of the Hansa on Lemgo. Another activity on offer is the ascent of the steeple of Saint Nicolas Church. The Northern one of the two steeples is owned by the city and from the top, you have an amazing view over the city and the surrounding land. The members of the Hansa commission of the city council attend the breakfast and happily answer all Hansa-related questions of visitors hungry for knowledge. Special thanks always go to the sponsors, the market traders, the bakeries, and also to the performing groups and caterers. The event is coordinated by Lemgo Marketing and the Vorstandsstab of the municipality. historical town centre with examples of the Weser-Renaissance, Brake Castle, St. Nicholai Church with its two dissimilar towers, historical Town Hall.